Much as I love the local restaurant scene, it hasn't escaped my attention that -- with the exception of Jennifer Coco, Issa Moskowitz (whom I believe is back in Brooklyn most of the time these days) and Jessica Urban from Block 16 -- there haven't been very many woman chefs making their mark around here. Record scratch. That's all changed. Pretty much over night. The year 2018 happened and, all of the sudden, Omaha and Lincoln have gotten some serious pastry chef cred. And they're all --100 percent of them -- women. I'm not talking about home bakers who decided to sell cupcakes on the side. While it's great to see those businesses succeed, they rarely put any town on the map. The women I'm referring to are seriously-educated, seasoned pastry chefs -- two have worked in the most photographed and written-about kitchens of the 21st century; one is making national headlines for making dietary restrictions delicious, and one has been a fixture in the local industry for nearly a quarter-century. They have withstood the heat, and they have stayed in the kitchen. Now they're turning Nebraska into a bread and pastry Mecca, and they've got some words of wisdom for being a woman in the kitchen. Ellie Pegler and her friend from culinary school, food stylist Brett Regot, who joined her in Omaha to oversee Farine + Four's savory program. "Pick up the 50 pound bag of flour and carry it over to the flour bin yourself. Lift the heavy stock pot from the top shelf on your own. Don't ask a guy to do it for you because you're creating a distinction between him and you, when at the end of the day we're all chefs instead of being a female chef or a male chef. Put your head down, work harder, be better and own your job, ego and confidence." Angela Garbacz also attended the FCI/ICC and has been baking professionally for nearly two decades. After learning of her own dairy intolerance, she began developing recipes and blogging about gorgeous baked goods that even those with dietary restrictions can love. That led to the opening of Goldenrod Pastries in 2015, and spots on several chefs-to-watch lists, including Food and Wine's The Most Innovative Women in Food and Drink. 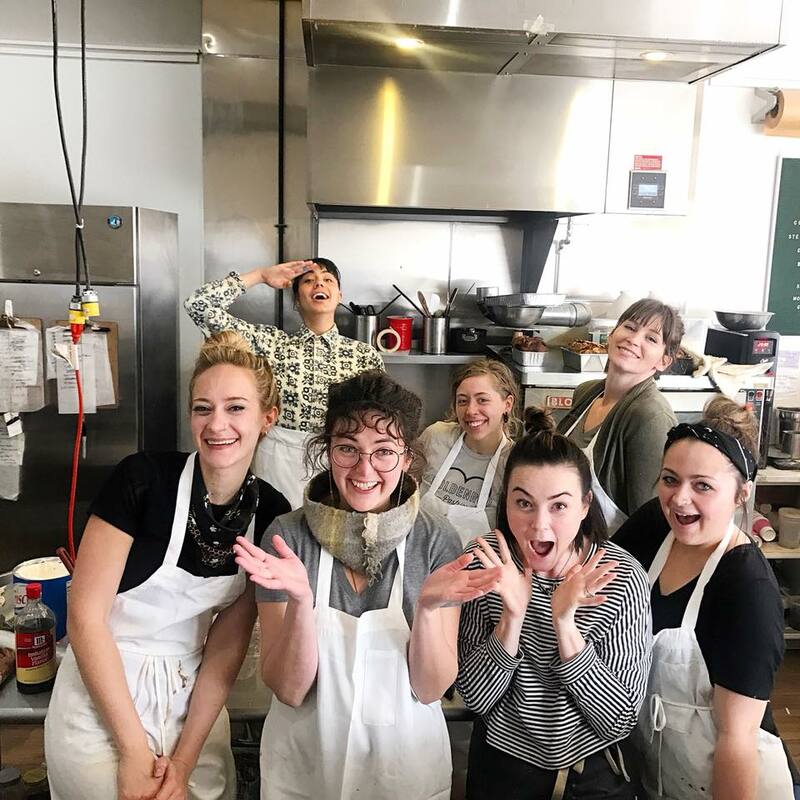 For Women's History Month, Angela has joined forces with several chefs around the country to form Empower Through Flour to help spread the message of I Am That Girl, a non-profit working to provide girls the tools they need to succeed. While Angela isn't against the idea of hiring men, she is all about creating an atmosphere of female empowerment in the workplace. "It's very exciting to be in a place where there are open conversations about being a woman in any industry - but especially the food industry. This can be a really brutal industry, so having open, honest dialogue is really important. A decade ago, you really just had to go with the flow. No one cared if you were mistreated or disrespected. You just kept your head down and worked. That has changed so much in the past ten years, and even more so in the past 6-12 months. It's even impacted the way I work as an employer. I have a team of 12 women at Goldenrod and it is my responsibility to create a supportive and positive work environment for them. I want to hire people who have passion and drive, and I want to do what I can to support them - and to create an environment where they support each other. Women have a lot of power, and that will grow the more we encourage each other. I have seen my business grow so much by cultivating this work environment. Realize that other women will be your greatest allies - they don't have to be your competition, and you will all be more successful if you support each other." Kalle Georgiev likes to say she attended the culinary school of Daniel Boulud. The former wealth manager quit her job in finance on a Wednesday eight years ago and by the Friday she was working in a kitchen. She joined the Daniel Boulud empire by answering an ad on Craig's List and worked her way up the kitchen hierarchy at several of the group's restaurants, where she counts many women chefs, including Ghaya Oliveira, winner of the 2017 James Beard Foundation award for Outstanding Pastry Chef and DB Bistro Moderne rising star Ashley Brauze, as her mentors. 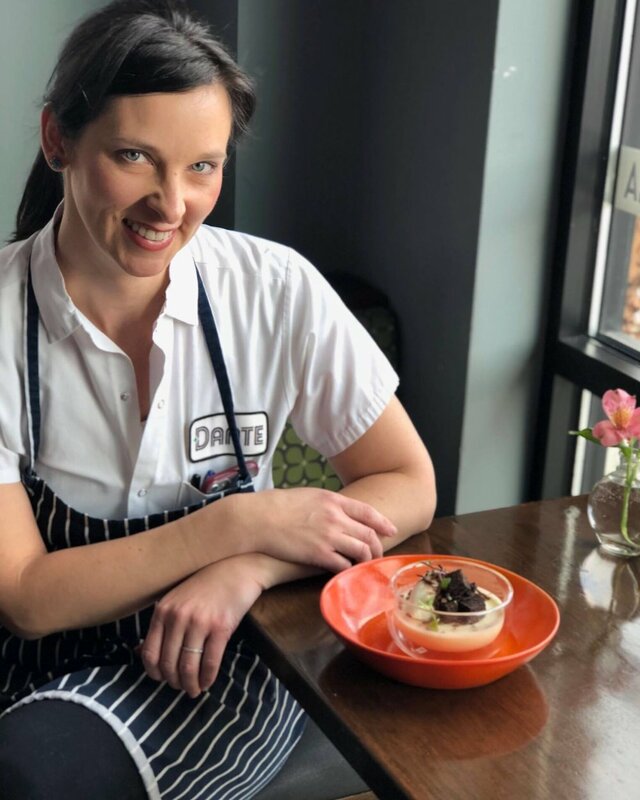 Now, back in her native Omaha to raise her daughter, Kalle is overseeing the pastry program at both Dante locations. "NYC is ruthless, cutthroat, and brutal for anyone, especially if Michelin stars are on the line. The professional kitchen, whether it’s pastry or savory, is very much still male-dominated. In one instance, I was humiliated in front of the entire kitchen for something very trivial and was yelled at again later for not acting upset enough about it. (Was I supposed to cry?) I am 99% sure that would not have happened had I been a man. Omaha, by contrast, has a more laidback kitchen environment. But regardless of where you are, don’t believe people when they tell you you can’t do something. (Just like my toddler, that makes me want to do it more!) If you want to go far, you will need to find your limits, and that can be painful. But, you will be surprised at who you really are and what you’re made of. " Tina in her beautiful dream shop, Chocolat Abeille. Tina Tweedy has been part of Omaha's Old Market restaurant scene since the early '90s and she has seen it grow from a scant handful of beloved classics to a vibrant, chef-driven dining destination. As a pastry chef at M's Pub, she used to dream of selling her chocolates across the street in the romantic Old Market Passageway. After a devastating fire temporarily closed M's, she was presented with a few opportunities that would have put her career on the fast track, but opted instead to open her own shop, the delightful Chocolat Abeille. Her advice to other women? "The work that you do will comprise a great part of your life. Always stay true to who you are and your food will reflect that. Don't be afraid to ask for what you want and never settle for mediocre. Be a person of integrity and compassion and find joy in your work. The food you create affects others. Keep it simple, make it beautiful, and let the ingredients shine. Always strive to learn more, then share what you know."